Poppy and I were returning from a weekend road trip to Virginia (less than successful due to the weather down there!) via Route 522, which winds through apple country. Of course we’ve got lots of apples here in Pennsylvania, but Bill was excited about going to a big roadside market he’d made a habit of stopping at in the past. When we got there, though, the place was packed with tourists and travelers, and I could tell by the prices that they were merely brokers for lots of local orchards, so naturally I was too snooty to buy anything. If they’d had Honeycrisp or Northern Spy I might have changed my mind, but they were just selling standard varieties so we got back in the car. A few miles down the road we saw a hand-lettered sign directing us to an orchard a few miles off the highway, however, so we turned in, and found what I was looking for. A farmer (do you call orchard men farmers?) and his parents had a garage full of several types of apples, including some he called “banana”, which were a greeny-gold, small, crisp, and tart. We bought a big brown grocery bag of mixed banana, golden delicious (I like those mixed in my applesauce for their sweetness) and his Yorks, which were big, meaty, crisp, and tart. Today I made a batch of applesauce out of a mix of the three, and a pie from this recipe from the Simply Recipes website. The pie is unusual in that the crust had to chill in the freezer for an hour before filling and baking. I was a little nervous that my spatterware pie plate might crack, not being sure if it was freezer-to-oven proof, but all was well. However, the applesauce was cooking while I was putting the pie together, and after I got the pie in the oven I began to notice something unusual about the apples in the pot. Two varieties had completely disintegrated while one of them was still as hard as a rock. “Oh no!”, I thought, “Is that the York, the one I just made the pie with? !” And sure enough, it was. As of now, 4 hours after I started it, the pot of applesauce is still cooking and those darn Yorks still haven’t broken down! I wound up baking the pie at least twice as long as the recipe called for, lowering the heat a bit so the crust wouldn’t blacken, but I can tell from sticking a sharp knife into it that the apples are still too hard. I finally took it out after about 90 minutes, because I was afraid of incinerating the crust and crumb topping. I just know my dinner guests are going to try to reassure me and tell me it’s not that bad, while I am gritting my teeth and crunching through those tough apples! Lesson learned the hard way (heh-heh, at least I can still make foodie puns); do not use York apples to cook with! 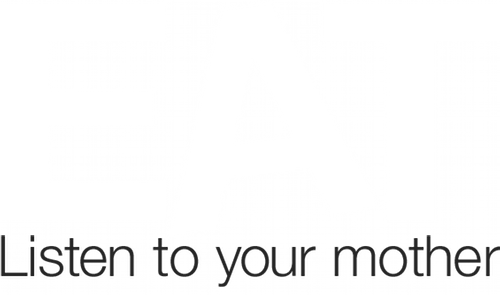 I did this so you, dear readers, don’t have to! They are an eating apple, not a cooking apple. 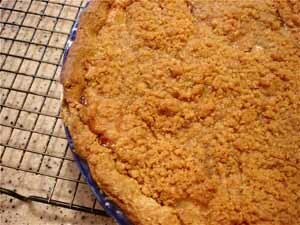 Addendum to apple pie with crumb topping – Even though, as I feared, the apples were a bit underdone, this is a wonderful recipe. The flavors are divine, and I will definitely try it again, with appropriate cooking apples. Route 522 goes all the way to Virginia? I had no idea. I’ve learned so much from this post. Honeycrisp and Northern Spy are good apples to buy from roadside farmers, and no Yorks in pies. Oh-and try Elise’s pie recipe. I’m very snooty about my peaches. I won’t buy any after August 15. It’s a Georgia thing. I had my first Northern Spy last weekend, from Locust Grove farms at the greenmarket in New York. So delicious! I had no idea! I’ve been on a bit of an apple kick myself—I’ll be sure to stay away from Yorks, though, except for snacking. Julie, after I read your comment I doubted myself since geography isn’t my strong suit (in fact it’s always the category my opponents pick to stump me in Trivial Pursuit); I began to think we had actually been in West Virginia when we bought the apples, and we were in West Virginia for part of the trip, so I checked the map and found that 522 does bisect the top corner of Virginia. We took it between 70 and 66. Yes, Anne, those late-season peaches can be very hit-or-miss and apt to be mealy (gag!). I haven’t seen the Northern Spy yet, Barletta, but according to Lindy on Toast they are the best apples for pie. The pie looks fantastic!!!! I wish I had read this column before my stop at a fantastic roadside stand on Rte 30 in the Laurel Highlands (PA) this afternoon. They had a huge variety of apples (as well as a 761 pound pumpkin) where for $2 or $4 you could fill a small or large bucket with any apples you wanted. I didn’t have time to dawdle, so just threw in six different varieties of eating apples, but have no idea which is which. It was refreshing to not see the “same old same old”. The apples also had blemishes and no wax coating – another welcome change from the supermarket!